VR has been hitting the headlines again recently with the release of the PlayStation VR not so long back and it made me realise that I’ve not made use of it’s 90’s equivalent in a year or two, the VFX-1. There aren’t a whole load of supported games to pick from, so I went for one of the more obvious choices Descent. 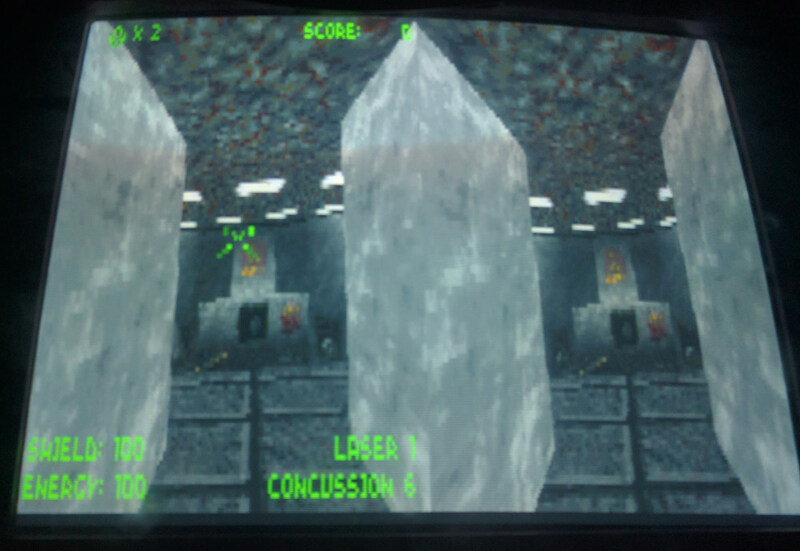 Descent was originally released in 1995 in the wave of Doom clones that was hitting around then. Its twist on the genre was to allow full freedom of movement in all directions making for quite a unique experience to this day. It’s a game I already know fairly well having played it back at the time but I’ve never spent much time on it in VR. First as always, the plot. At some time in the future, a virus has taken over the robots being used to mine resources on the various planets and moons of the solar system. These robots have turned on their creators and started producing more deadly robots of their own. This threat could soon spread to Earth if nothing is done so for reasons that aren’t entirely clear, the player is drafted in by the bureaucratic PTC mining corporation to go in single handed and blow up the reactors in all of these mines destroying them entirely and shutting down the threat. 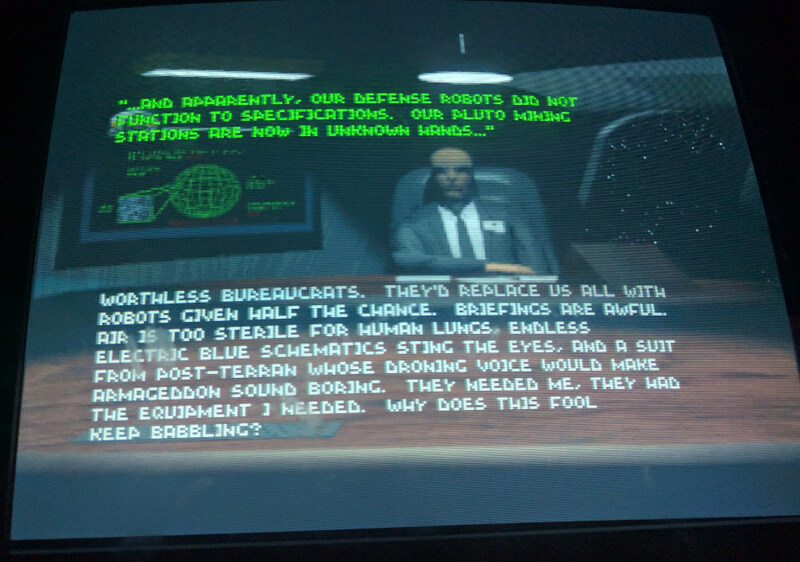 This story is told with a static screen intro overlaid with text. 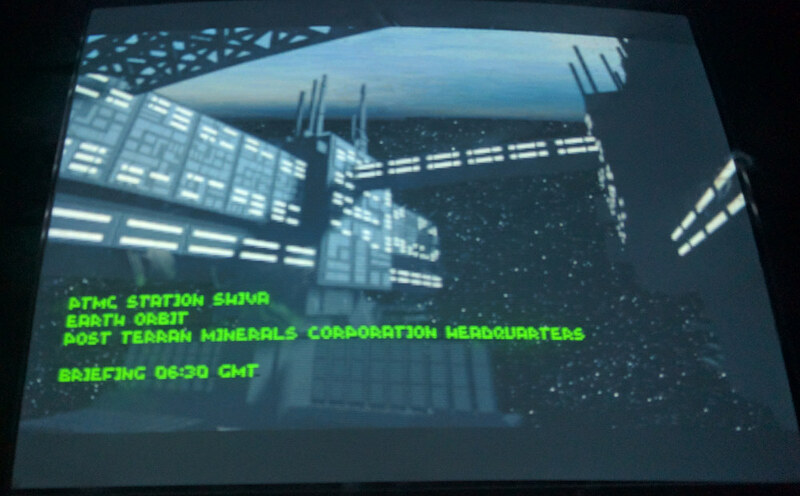 Each mission then has a little briefing text before you start to advance the plot. I’m usually all for a storyline in my games but none of this adds anything in particular. It’s nice that the developers appear to have put a little effort but in truth the game would have better off taking Doom’s approach and ignoring it. The basic gameplay formula is certainly pure Doom. In essence, blast your way through 30 levels, finding the 3 coloured keycards to get access to wherever you need to go. There is a boss of sorts at the end of every level in the shape of the reactor which doesn’t move but will shoot red spheres at you. The levels are huge and sprawling and the complete antithesis of your modern FPS where the player is led through the map. You should fully expect to get lost when playing Descent but there is a confusing 3D automap to help guide you back to the right path. The control system is quite something to get your head around with a myriad of different weapons and options. It is fully redefinable but will still take some getting used to whatever you go far. The control system is more comparable to the lights of Tie Fighter than Doom really with steering the ship best done with a joystick since this is part flight sim. It’s also part FPS and as such has strafe controls but this time you get four of them since you can also go up and down. Not to mention rolling left and right if you don’t want to end up with the ceiling underneath you. Navigating a 3D map is hard enough without having to cope with being upside down. The ship has independent energy and missile weapons with 5 of each. None of the weapons are especially memorable if you ask me but it is important to save the heavy artillery for the tougher enemies. There are also mines to drop behind your ship which I can’t confess to ever using much when I’ve played in the past. The energy weapons draw energy from the ship which needs to be replenished by pickups off blown up enemies or by flying through a recharge station of which there is at least one on every level. Similarly shields are charged by picking up blue spheres dropped by enemies but you don’t get to charge these up any other way. Very strangely for a game like this, there is a lives system which is probably almost entirely ignored by anyone playing through the campaign. If you do wish to make use of it, you can restart a level from the beginning with just the basic ship loadout. All of the enemies will still be dead and if you fly back to where your ship exploded you can pick up all the gear you had before. It can act as a get out clause if you save somewhere you shouldn’t provided you can make it back to all your lost equipment of course. There are a wide variety of enemies in the game starting with slow moving varieties that shoot equally slow fireballs and lasers at you. It starts getting tougher when you get enemies firing missiles, especially homing missles and the Vulcan cannon firing bots that are the equivalent of Doom 2’s chaingun guy. The enemies is this game are smarter than your typical Doom enemies being able to follow you around the map and you really need to be careful when entering new areas. 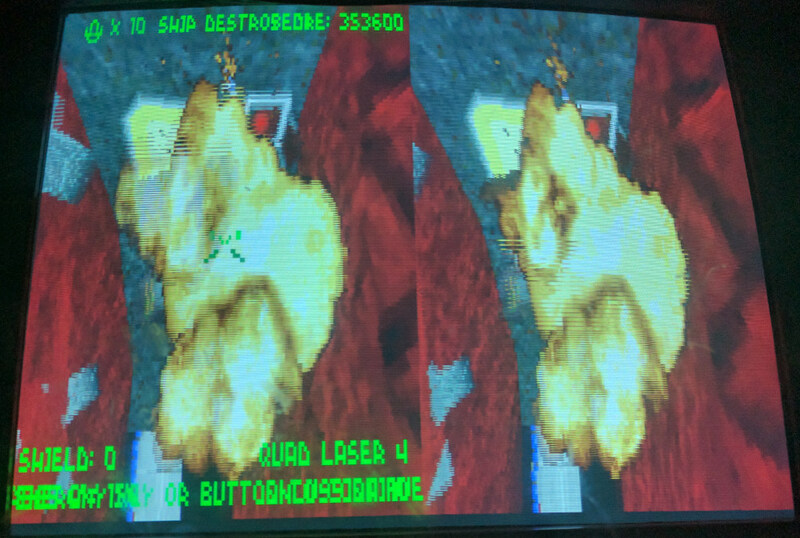 For VR, Descent uses the side by side picture approach which the VFX-1 then splits up between the two eye pieces. This loses horizontal resolution which is exactly what doesn’t suit the headset since it has far more horizontal than vertical pixels. Descent 2 would support the alternative mode with interlaced horizontal lines and looks a good deal clearer because of it. As such, I wouldn’t say my view of the world is exactly crystal clear with distant objects vanishing in a blur of giant pixels. Another quirk is that the HUD is only shown on the left window and therefore in only one eye. This does make it float above the action but causes major eye strain after a while. 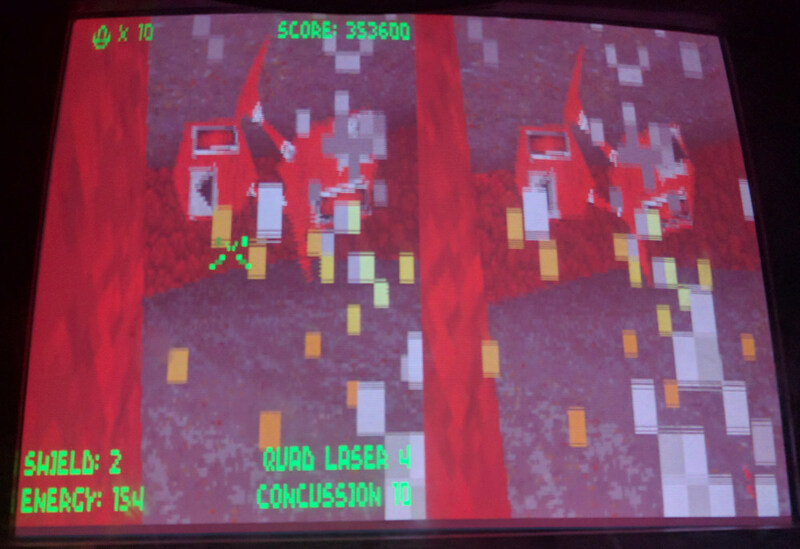 It does have to be said that the 3D is very effective and does draw you into the game when you can see all the laser blasts literally getting nearer and flying past. 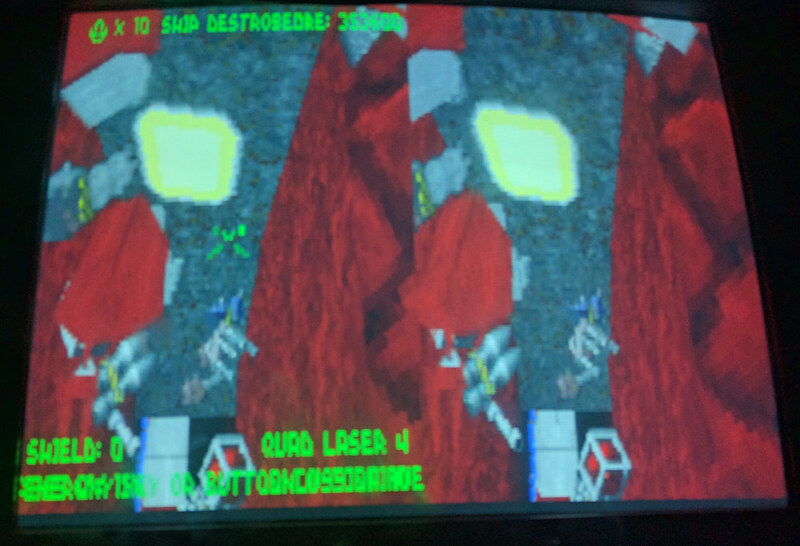 Descent is highly playable on the VFX-1 in this respect. 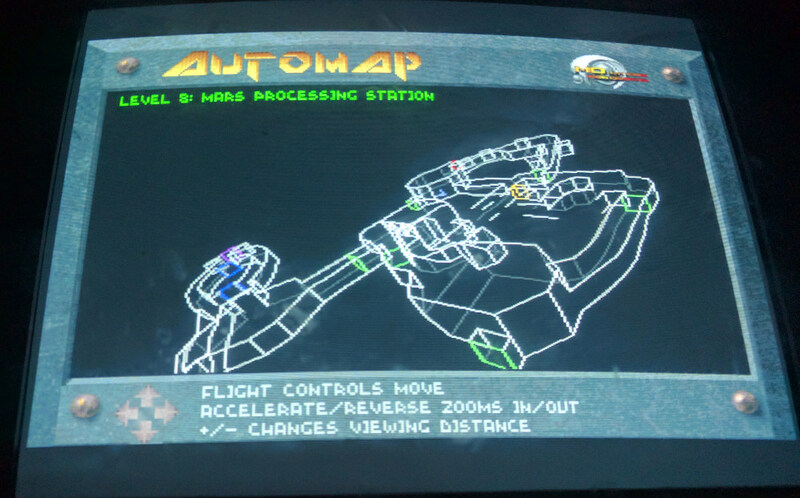 What doesn’t work is the automap screen which doesn’t swap the mode of the headset meaning that I have to flip up the visor and use my monitor screen to see the map. Also the head tracking doesn’t appear to work correctly only moving the view a miniscule amount. I played as far as the end of level 7 where the first boss is encountered. This is a giant ship that keeps teleporting around a circular cavern and firing smart missiles every time it pops up. This was the final level in the demo/shareware release as I recall with a lot of the enemies and weapons held back for the later levels of the full release. 7 levels is where I stopped however. Technically Descent is really impressive but I’ve always felt it lacked the spark to make me want to keep coming back to it. I love space sims and I love Doom, this should have been a game I adore but it still leaves me a little cold. Every level is large and challenging but the gameplay gets repetitive long before you make it through the first half of the game. The whole experience lacks character for me. This really isn’t being helped by the 90’s VR experience. 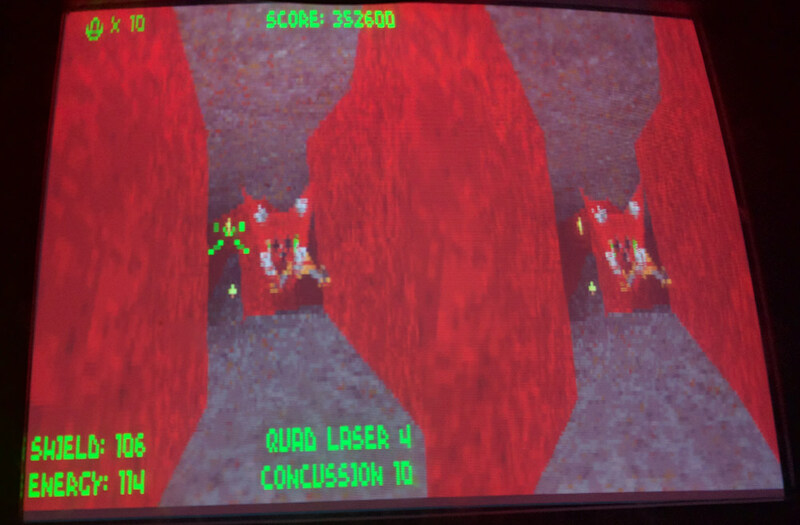 I’ve played a few games on the VFX-1 with no real side effects but by the time I have played two levels of Descent on it, I’m feeling quite ill. The motion sickness induced by the full 3D environment is considerable and is combined with eyestrain because of the single eye HUD. You simply can’t play more than one level on an evening unless you are prepared to suffer for it, and Descent isn’t a good enough game to justify the pain. If there was ever a game to show why 90’s VR didn’t work out, this could be it. I’m really curious to know what the motion sickness would be like on an Oculus with a full 3D game like this. I played a little without the headset to grab a few quick screenshots and have to say the overall experience was much improved even with the screen still split in two. There are some modern source ports available which would no doubt be a much better option for playing this than DOS. I’d no doubt more positive if I’d used one of them instead but as it is, I can’t exactly recommend Descent. There are clearly people who enjoyed it a lot more than I ever did though. Speaking of which, I’ll dig out all the UK magazine reviews I can find around here and post them up within the next couple of days. This entry was posted in Off Topic and tagged descent, vfx-1 by Pix. Bookmark the permalink. 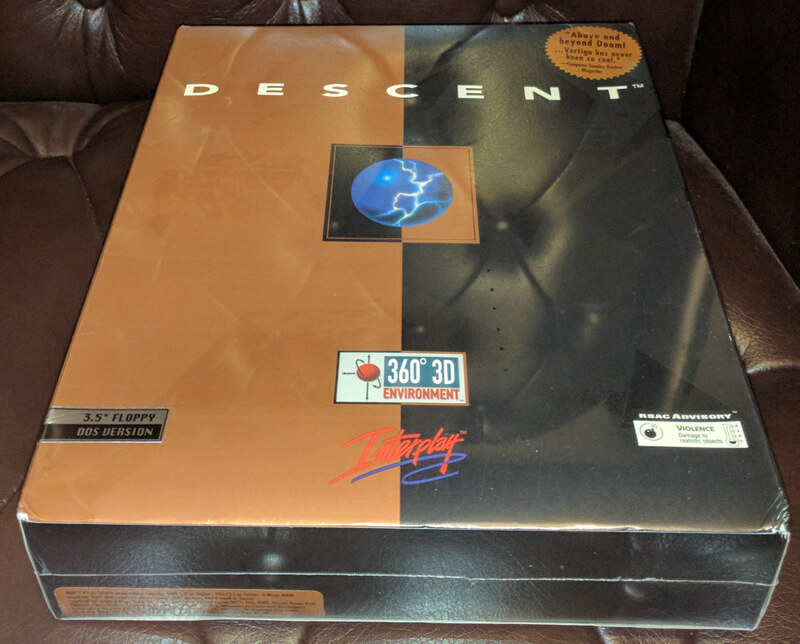 I’m a fan of Descent (all 3)! Wouldn’t play them with the cockpit off though. I’d quite like to read the PCZ’s review of Descent2. An article in the 1996 Quake issue went into detail about how they hated the Guide Bot from D2 (which would’ve been released a couple months before that). I didn’t get a choice about the cockpit in VR mode as you are in theory supposed to be able to look around. I know what you mean though. I always leave the cockpit on in Wing Commander. I kind of liked the guide bot myself. It’s not like you were forced to use it either. I’ll include that Descent 2 review when I post the others tomorrow. Yeah, and the little chirps it made, I liked the bot, especially in D3. Not enough first-person games have gadgets that can be sent off on tasks for you.